Spring 2006 Students Arrive at Umbra! 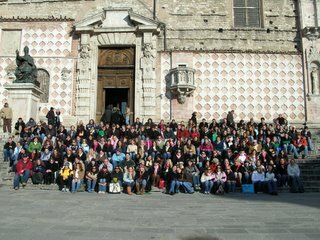 Nearly 200 students arrived in Perugia last week to begin the Spring 2006 semester. These students, like the ones who have studied at Umbra before them, have already begun the language immersion program at the Universita per Stranieri and at the Institute. This intensive program is one of the unique benefits of studying in Perugia. events–walking tours, pizza nights, and the obligatory orientation meetings. It will take time to adjust to life in a new country, but we’re already seeing students making the effort to fully immerse. Continue to check the Umbra Institute blogspot as we post photos from the students’ study abroad experiences this semester. In photos: Umbra students take a break from orientation for a group photo on the steps of Perugia’s duomo; students ask questions of Lindsey Thompson, student services associate, and Francesco Gardenghi, director of Italian language, during orientation sessions.